It is COOKIE time. I am on a cookie kick. I was on a cupcake kick, and I pray my next kick, will be going to the gym, but that is another entire blog. 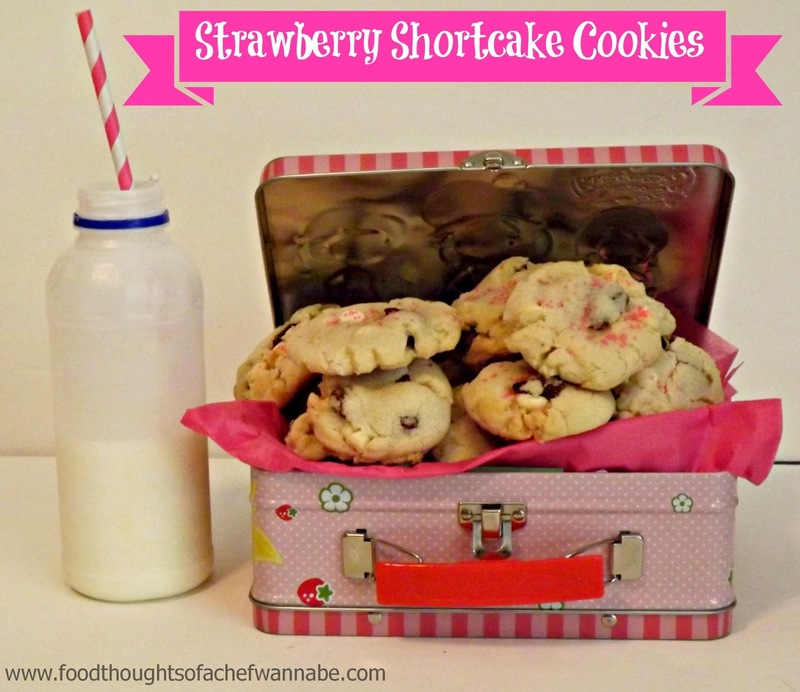 My sister makes these awesome Strawberry Shortcake Cookies. She gets the dough from some big name cookie company, which I am sure you can guess. They are bomb, no matter how you slice it. I just prefer less "junk" if I can help it at all and so I decided to try my own. Besides, I LOVED Strawberry Shortcake, as a child. As in...the cartoon. I wanted to BE Strawberry Shortcake. Oh, the days when nobody thought you were delusional, or needed meds, when you wanted to grow up to be cartoon characters! I used a sugar cookie recipe that I fancied up. It is as simple as that. I like soft cookies. These are soft, yet chewy, perfection in my opinion. I prefer this, so, if you don't, remember this is all about me. HA! Really though, if you like a crunchy, crispy cookie, this isn't your ride. I sprinkled the top of mine with pink sugar, but something just occurred to me. WHY, didn't I use red? WHY do I always associate strawberries with pink? I do that all the time. So use pink, red, plain white, whatever tickles your funny bone. (by the way "funny bone" is not what I originally typed). I think that is about it. These are a delicious cookies and I hope you enjoy them! Preheat your oven to 375. In a large bowl or the bowl of your stand mixer, cream together sugar and butter. When it is light and fluffy add in vanilla, egg and baking soda. Combine thoroughly. Add in flour and mix until just combined. Stir in strawberries and white chocolate chips. On a lightly greased baking sheet, scoop your cookies, flatten them slightly, and sprinkle with sugar (optional) Bake for 10-13 minutes. Let cool 5 minutes on your cookie sheet and then transfer to cooking rack. Repeat until all cookies are baked. I am in love with these. Can I move in and be your daughter?? Pretty please? I will behave like an angel. Did I mention I love Strawberry Shortcake? She is the bomb!! !